A cerebral aneurysm is an abnormal swelling of a blood vessel wall inside the brain. A cerebral aneurysm occurs at a weak point in the wall of a blood vessel (artery) that supplies blood to the brain. The bulging aneurysm can put pressure on a nerve or surrounding brain tissue. It may also leak or rupture, spilling blood into the surrounding tissue (called a hemorrhage). Some cerebral aneurysms, particularly those that are very small, do not bleed or cause other problems. 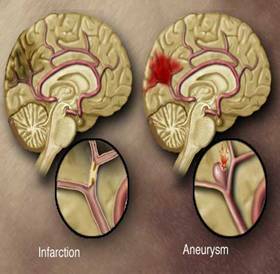 Aneurysms may result from congenital defects, pre existing conditions such as high blood pressure and atherosclerosis (the buildup of fatty deposits in the arteries), or head trauma. Cerebral aneurysms occur more commonly in adults than in children but they may occur at any age. They are more common in women than in men, by a ratio of 2 to 1. A person may inherit the tendency to form aneurysms, or aneurysms may develop because of hardening of the arteries (atherosclerosis) and aging. Aneurysms are also classified by size. Small aneurysms are less than 11 millimeters in diameter (about the size of a standard pencil eraser), larger aneurysms are 11-25 millimeters (about the width of a dime), and giant aneurysms are greater than 25 millimeters in diameter (more than the width of a quarter). Aneurysms usually cause no symptoms unless they rupture and cause bleeding into the brain. However, a sudden, extremely severe "thunder-clap" headache is the telltale symptom that an aneurysm has ruptured. Sudden, severe headache (sometimes described as a "thunderclap" headache that is very different from any normal headache). On the CT scan it may be possible to see an evidence of hemorrhage associated with a brain aneurysm. CT Angiography : - is a noninvasive way of seeing brain blood vessels but often does not give well defined images with which to plan treatment. MRI : - examination shows in detail the aneurysm and it relationship to the brain. Carotid & Vertebral digital substraction angiography : - is the definitive method to detect aneurysms. Using a groin artery, a catheter is placed in the blood vessels leading to the brain and a contrast agent or dye is injected to photograph the blood vessels. Unruptured aneurysm would probably be treated with a surgical procedure called the clip ligation, as described below.